The use of a special micro-lens and the chip-on-board technology enable optimal curing with UV LEDs also in the case of 3D geometries (example of a wooden door). Due to their high resilience and resistance to scratching, UV paints and varnishes are being used more and more to coat surfaces. They contain almost no solvents, have high gloss levels and can be cured within split seconds. Innovative UV technologies offer new options to make curing processes more efficient and less energy-consuming. UV paints and varnishes are cured by UV light. They contain almost no solvents that may evaporate during the curing process, so that the UV curing process is called polymerisation – a cross-linking reaction of the paint constituents. Fig. 1 to 4 show the process. The photoinitiators contained in the paint play a decisive role and are prerequisite to the process (Fig. 1). They absorb the photons of the UV light (Fig. 2) and convert their energy into chemical chain reactions (Fig. 3) until complete cross-linking has occurred (Fig. 4). The result is the curing of the coat of paint. 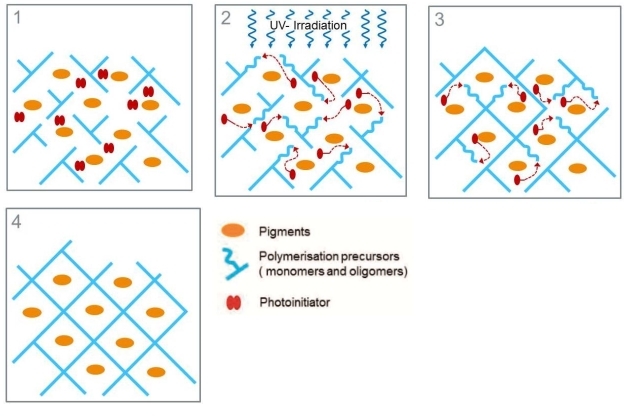 2 – Photoinitiators are activated by intensive UV light, free radicals react with monomers and oligomers, chemical bonds are split, the varnish is still moist. 3 – Photoinitators interlink to form new compounds and different macromolecules, the varnish starts drying. 4 – Polymerisation is finished, curing is completed, the varnish has dried. Medium-pressure lamps provide a wide spectrum. Medium-pressure lamps have been used successfully for many years for UV polymerisation. The advantage of their broadband emission spectrum (Fig. 5) is that photoinitiators can be used in a large variety of applications. Their high energy enables high process speeds but often a lot of energy is also used for this. Medium-pressure lamps are available with different dopings which allows optimisation of paint curing and high coat thickness can also be achieved without a problem. In specific applications, such as the coating of coniferous wood, the heat generated at the surface of the material often poses a challenge. In particular in the case of low machine feed rates, this may result in damage to the substrate or the paint applied. 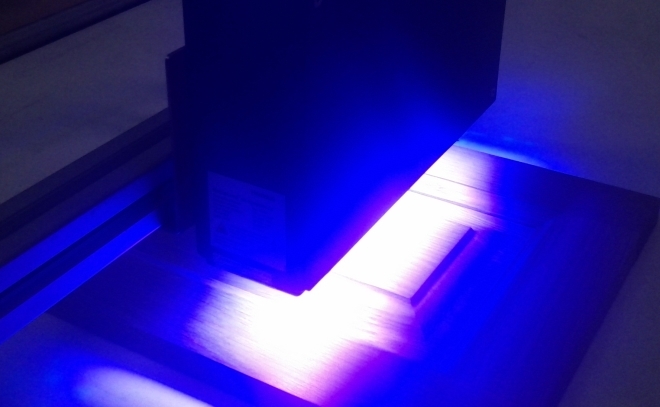 Modern UV LED technologies offer new possibilities for optimising specific curing applications. The heat problem is also solved by the use of UV LED modules. Almost no heat occurs at the surface of the material because UV LEDs do not emit infrared radiation. This makes them very well suitable for curing, especially also for heat-sensitive materials such as coniferous wood or foils. Power output and dimensions of LED systems can be scaled. Thus high process speeds of 60 metres per minute and more can be achieved without any reduction of the curing quality. The NobleCure® UV LED module developed by Heraeus Noblelight is available with various wavelength configurations from 365 to 420 nanometres. 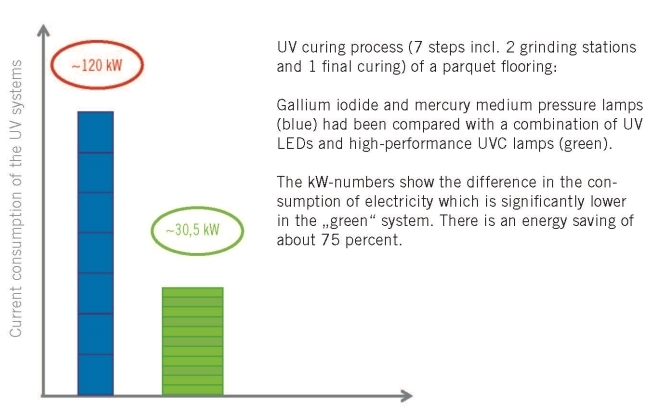 As almost 100 percent of the spectrum is inside the UVA range, the curing effect of the LEDs is similar to that of gallium-doped medium-pressure lamps. They achieve very high penetration depths even in the case of thick coats and ensure good adhesion of the paint to the substrate. In particular, the so-called pinning applications profit from this. The material is well cured deep inside but remains slightly sticky at the surface. This means that the next layer adheres especially well. Another challenge for UV LED systems are working distances of more than 10 millimetres. The angle of radiation of LEDs is very wide which means a lot of stray light and low intensity on the substrate if the working distance is too large. Micro-lenses can be used to qualify LED systems for industrial coating applications. They reduce the angle of radiation of the LEDs and enable working distances of 70 millimetres and more. UVC high-performance modules optimise curing. UV LEDs emit a monochromatic light spectrum. A result of this may be incomplete UV cross-linking of a paint. In particular, the surface may remain sticky due to the lack of radiation in the short wavelength range. To enable a wide variety of applications in spite of this, new types of UVC high-performance lamps can optimise the UV LED curing process. 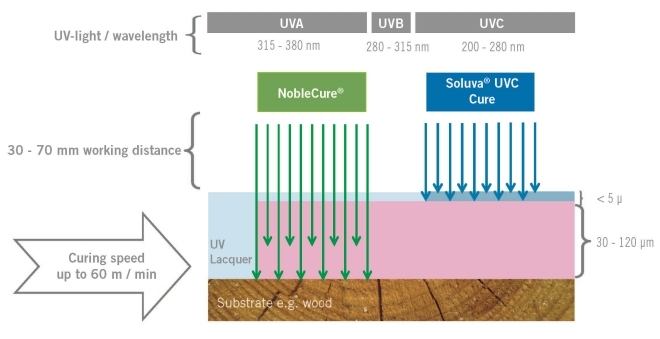 Method combining different UV technologies for optimal curing results: UV LEDS are used for deep curing and in intermediate steps, UVC high-performance lamps are used for homogeneous curing of the surface. 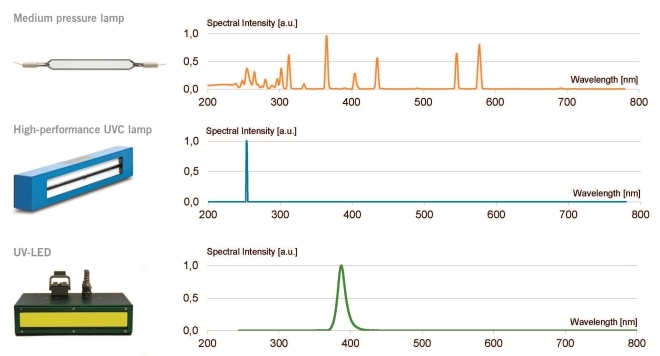 UVC lamps radiate short-wave UV light in the spectral range of 200 to 280 nanometres (UVC) (Fig. 5 and 7). This supplies the necessary photons that also cure the surface evenly. The UVC light clearly reduces oxygen inhibition at the surface. Such homogeneous surface curing is especially important prior to grinding or for the final sealing of the surface. High-performance lamps with patentend reflectors are integrated in Heraeus Soluva® UVC Cure modules. The QRC® reflectors increase the intensity of the lamps, while energy consumption remains at low levels. Their low heat generation also makes the innovative modules attractive for applications involving heat-sensitive materials. Their extremely long service life allows longer maintenance and servicing intervals which, in turn, means reduced efforts and costs. Moreover, additional cleaning of the lamps is not necessary due to the special reflector. As in the case of curing with UV LEDs, flexible radiation exposure distances of up to 70 millimetres and high process speeds of up to 60 metres per minute can be achieved with UVC high-performance modules without reducing the curing quality. If UV LEDs and UVC high-performance lamps are combined in a curing process, they represent an innovative alternative to conventional curing methods. Long life, low heat generation, flexible radiation distances and increased process speeds are decisive advantages. Low maintenance requirements and, above all, low energy consumption mean a substantial reduction of the process costs. Especially in times of increasing electricity prices, it is worthwhile to invest in energy-saving alternatives like this one. Energy savings of about 75 percent (Fig. 6) compared to conventional methods are possible if UV LEDs are used in combination with UVC high-performance lamps. The environment is also protected as both methods do not release ozone. 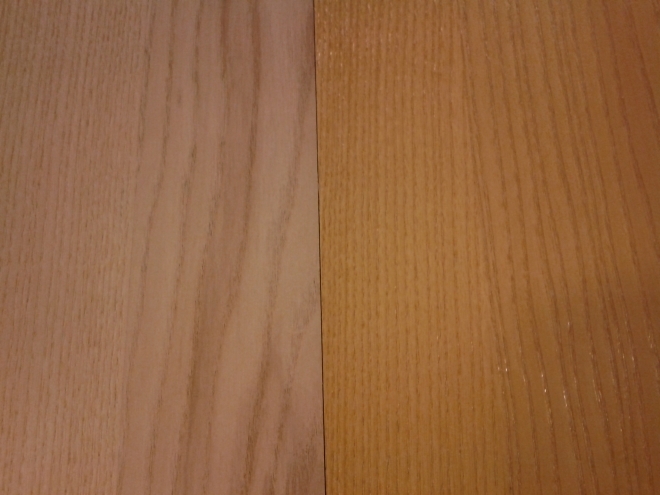 Varnishes formulated exclusively for UV LEDs tend to yellow during curing (photo on left, example of a cured parquet floor). This effect is prevented by the combined use of UV LEDs and UVC high-performance lamps (photo on right). In addition, the combined use of both technologies provides new opportunities for simpler and hence cheaper formulations of paints and varnishes. Moreover, varnishes formulated solely for UV LEDs tend to yellow during curing. Through the combined use of UV LEDs and UVC high-performance lamps, this effect is not more visible than if conventional medium-pressure lamps are used (Fig. 9). The design of the Heraeus UV modules is modular, so they can be integrated in almost any location in the plant. Applications with different light sources can be tested in the Applications Competence Center (ACC) in Hanau. Various UV radiation chambers and installations are available at the ACC to measure and compare the different effects of UV light under the most varied conditions. Moreover, the Heraeus energy efficiency check helps determine how money can be saved and energy can be used more efficiently in the curing process. Optimise your process for best curing results and test your UV application at the ACC – to keep surfaces appealing for a long time.